Genesis 22 is a tough passage for Christian skeptics and even some believers to accept. 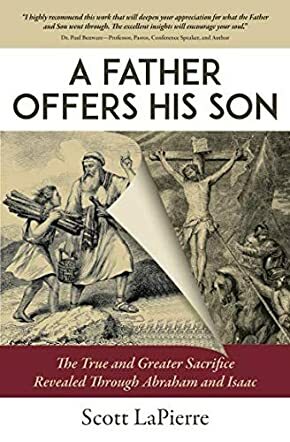 The way Scott LaPierre unfolds the message of this passage in A Father Offers His Son: The True and Greater Sacrifice Revealed Through Abraham and Isaac offers the reader assurance and trust in The Lord God. God’s great love for us, demonstrated through Christ, is foreshadowed in the Genesis story of Abraham and Isaac. God asks Abraham to sacrifice his only son. Genesis 22 is a prophecy of the New Testament; God sending his only begotten Son, Christ, to be sacrificed on behalf of the sins of man. LaPierre approaches the meaning of the Genesis 22 passage with biblical clarity and godly wisdom. It is clear that LaPierre knows the Bible and is in touch with God daily. From page one, the reader realizes that this author has spent countless hours studying God’s Word. As a Christ follower myself, I appreciate the way LaPierre unfolds Genesis 22 with the larger scope of the Bible and God’s love for us in mind. I could not agree with LaPierre more when he states that God wants us to appreciate his love. Ultimately, Jesus’ love and sacrifice will be glorified for all eternity. LaPierre provides the opportunity for us to appreciate God’s love by putting the reader into Abraham’s sandals. I could almost picture myself walking up the mountain and laying one of my own at the altar. Although God is full of mercy and his love unending, God’s wrath will be eternal for those who neglect the name and sacrifice of Jesus Christ. That is why it is so important for us to realize God’s purpose behind the meaning of Genesis 22. We must look at this passage as a parable of God’s love and sacrifice. God intentionally planned to include the story of a father who was asked to sacrifice his son in the Bible, as a means to help us relate to and realize the greatness of what God did for us in sending his Son.